ASUS Zenbook Pro 14 and Zenbooks Pro 15 are now official in the Philippines. 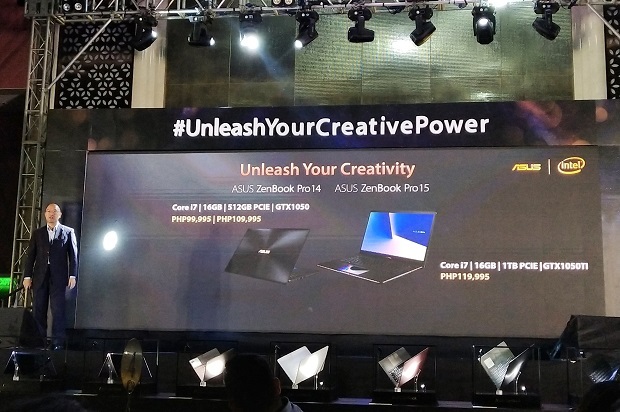 ASUS Zenbook Pro 15 and Zenbook Pro 14 are also announced in the company's Creative Power event in the Philippines last weekend. Both computing machines are powered by the ASUS ScreenPad technology which houses extra features and functions. The Screenpad is technically an intelligent touchpad which supports apps like Adobe Sign, Handwriting, SpeechTyper, etc. You can use ASUS Sync app to sync your smartphone in the ScreenPad. It also functions as a sencondary display using Extender Mode. The newly released ASUS Zenbook Pro 14 is a more compact alternative to the bigger Zenbook Pro 15. It is expected to deliver best performance due to the latest generation Intel Core i7-8565U processor. It also supports Gigabit WiFi and up to NVIDIA GeForce GTX 1050 Max-Q graphics. The Zenbook Pro 14 is housed in a stylish, slim and lightweight all-aluminum chassis. Plus, this laptop also sports the company's ErgoLift hinge design that elevates the keyboard in a subtle angle which, in turn, gives comfortable typing. The ASUS Zenbook Pro 14 also packs a 14-inch NanoEdge display with almost negligible bezels on all sides of the display (including the bottom bezels) for distraction-free viewing experience. The ASUS Zenbook Pro 14 and Zenbook Pro 15 will be available in Q4 of 2018; price starts at Php 94,995 and Php 119,995 respectively.